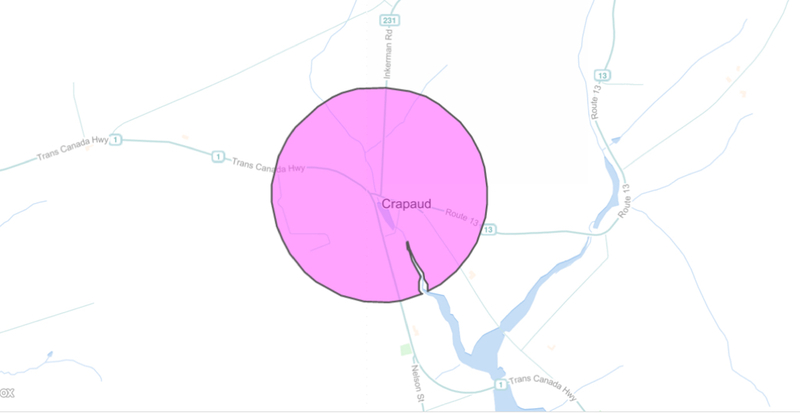 If you look at a map that shows the outlines of the boundaries of Prince Edward Island’s cities, towns and villages, it will not take long for your eyes to focus on the community of Crapaud. Whereas typical municipal boundaries are craggy polygons, the Crapaud is round. Look: it’s down near the bottom, just to the left of centre. The other item of note in this closer rendering is that there’s an odd sliver out of this circle that’s been excluded from the community, following the banks of the river. There is no hint in the proclamation why the village chose to organize itself circularly. And no mention of the missing sliver. I called the village office today, and they didn’t know the reason. A mystery to solve! Stay tuned. Written December 7, 2016 at 4:24 p.m.